Possibly the best hike I’ve ever done. Two glorious valleys, a pass, a summit with a 900 m drop off, four lakes, alpine meadows, waterfalls, snow fields and ancient subalpine forest. And it’s a loop! A panorama of Headwall valley to the left, Mt. Chester at Centre and Chester Valley to the right. We started at the Chester Lake parking lot. Hiked up Chester Valley to the lake before continuing on above the lake to the glacial scraped upper valley before arriving at a frozen lake at the base of an intimidating pass between Chester and Headwall valleys. reasonable. A small bit of scrambling before the summit and the huge 900m precipice of over the edge to Fortress Lake. After soaking in the panorama and the sublime views down Chester and Headwall valleys we descended down and began our descent into headwall creek valley just above the Chester/Headwall pass. Staying away from the path of the Cornice, we navigated our way down through loose scree and slabs to the upper reaches of headwall creek valley. An immense alpine setting with flowers, meadows, mossy streams and ancient boulders. As the views opened up down valley we encountered two pristine lakes fringed with snow ledges, talus slopes and small spruce. The trail below the lakes has been trashed by an avalanche over this winter and shows flood damage throughout from 2013. We were still able to follow the trail by jumping over deadfall and crossing avalanche debris. Entering the humid forest brought us back to earth. The green, the huge subalpine firs, the sound of creeks and thrushes. 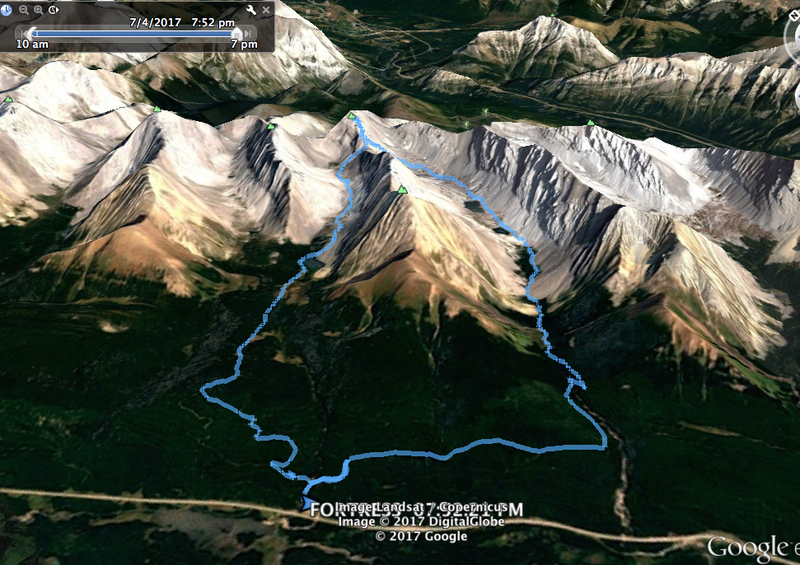 We continued our descent to the maze of trails connecting the Headwall creek valley to Chester creeks before arriving back at the parking lot 9 1/2 hours later. Looking back towards The Fortress. Looking over a cliff close to the summit over the Fortress Ski Hill, Lodge etc.